The police report for Tiger Woods' arrest on Monday morning has been released, and it confirms Woods' claim later Monday that alcohol was not involved in the incident. Woods was stopped by the Jupiter Police Department at 2:03 a.m. and booked in jail a few hours later on suspicion of DUI. The report explains Woods was driving a black Mercedes that was stopped in the roadway in the right lane. It also notes that Woods was "asleep at the wheel and had to be woken up" while the car was still running with its brake lights and right turn signal on. Woods had "extremely slow and slurred speech" and "stated that he was coming from LA California from golfing." The report also notes that Woods did not know where he was and asked how far from his house he was using "extremely slow, slurred, mumbled, confused" speech. He displayed confusion about where he had been and where he was going. 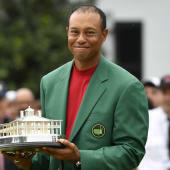 Woods was unable to complete a test of walking a straight line as he "missed heel to toe each time and stepped off line." He also failed a variety of other field sobriety tests and thought the officer was asking him to "recite the entire national anthem backwards" when he was in actuality being asked to recite the alphabet. According to another police report, Woods' engine was running when he was found asleep and, "the later investigation revealed fresh damage to the vehicle. Both driver's side tires were flat along with minor damage to both respective rims. There was also minor damage to the front driver's side bumper and rear bumper, and the passenger rear tail light appeared to be out." Woods blew a 0.00 on the breathalyzer twice, indicating no presence of alcohol in his system. An additional "testing facility task report" at 4:22 a.m. confirmed this. That report, which was presumably conducted at the police station, noted that Woods was "sluggish, sleepy and unable to walk alone." It also noted, however, that he was "cooperative as much as possible," but "very droopy, extremely sleepy, hard to keep eyes open, hard to walk." Woods said in a statement released Monday that he cooperated with officers, which seems to be corroborated by the police report. Woods also explained that an unexpected side effect from prescription medication -- and not alcohol -- was to blame for the incident. "I would like to apologize with all my heart to my family, friends and the fans. I expect more from myself, too," Woods said. "I will do everything in my power to ensure this never happens again.